In this photo, the James Webb Space Telescope has just arrived at Ellington Field, in Houston, Texas from Joint Base Andrews in Maryland. The telescope was safely ensconced in a special transporter case (called the Space Telescope Transporter for Air, Road, and Sea, or STTARS) which attaches to a truck. 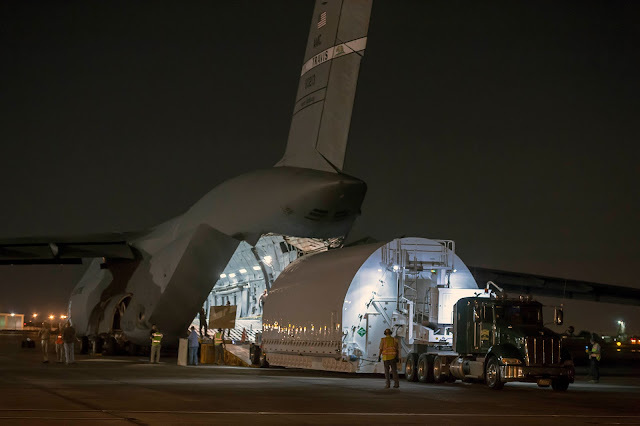 Webb telescope was first driven from NASA Goddard to Andrews, and then put in a C-5 cargo plane. The plane flew to Ellington, and then the telescope was transported by truck to NASA's Johnson Space Center for an end-to-end cryogenic test. Webb will undergo 100 days in a freezer (the huge test Chamber A), which mimics the extremely cold temperature at which the telescope will operate in space. Light will be passed through the telescope to ensure its optics are correctly aligned.